Shimla: The process of seeking No objection Certificate (NoC) for captive stone quarries from Panchayats for construction and development of roads and hydel projects will be henceforth waived-off as a move towards procedural simplification. 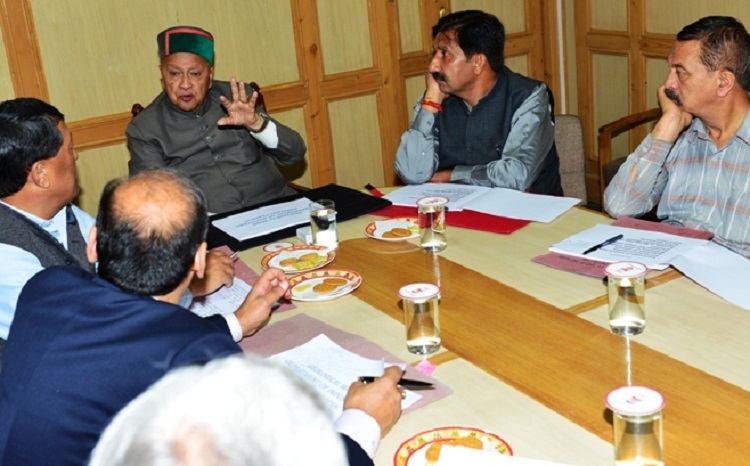 In a meeting to review mining activities in the State presided by Chief Minister Virbhadra Singh along with Industries Minister Mukesh Agnihotri today, it was observed that process of allotting crushers takes lot of time and end users have to go through numerous procedural formalities including NoC from environment, Panchayats, Forest clearances, and other line departments, the development activities, particularly construction of roads comes to halt which effects the budgeted works. It was also decided to maintain live registers and for online registration of applicants who apply for setting up the crushers and to submit monthly report to the Chief Ministers office. Besides, directions have to be issued to all Sub Divisional Magistrates to give report in a time bound manner and at the earliest concerning to setting up of stone crushers. Similarly, in another meeting pertaining to forest clearance by the forest department, the Chief Minister directed the forest department to adopt pro-active approach and guide the concerned departments and facilitate them in getting forest clearance. He said that most of the works were in limbo due to number of procedural formalities by the forest departments. The Chief Minister also directed the concerned departments to send the complete case to the forest department and said that in case of any observations, the Nodal officer of the forest department should call the concerned official to assist and guide about rules and should also hold weekly meeting with the nodal officers of the concerned departments.